All Purpose Entertainment Agency can book any comedian for any occasion. Whether it be a local, regional, or even national act, we have what you are looking for. Our comedians will have your audience laughing non-stop, entertaining those attending your event. Mike Cabot is an impressionist. And yes, he is a comedian. But more than that, he is the quintessential showman. By blending the art of comedy-impressions with good-natured audience participation, he delivers a performance unlike any other impressionist in the business. For more than a decade. Mike’s hilarious, on-target impressions of today’s hottest celebrities (in addition to many classic personalities) have consistently proven to entertain any audience. And because he work’s clean, his act is perfect for any venue — including concerts, corporate banquets, conventions, resorts, cruse ships, plus Atlantic City and Las Vegas showrooms. MIKE EAGAN Ask any comedian in the country, they will tell you…Mike Eagan is a comedians comedian. This is one of those funny people that make all the other funny people stay after their set is done to watch a master. He tells the most simple stories in the most disarming – and hilarious – manner. Whether the topic is driving on a crowded highway, sharing a bathroom with his wife or visiting the family at Thanksgiving, Mike finds the humor with a quick and very sharp wit. He is so fast you can actually watch the audience trying not to laugh in fear they might miss the next side-splitting gem. Mike has more than twenty-five years of stage experience and has made his mark from coast to coast and beyond. You can catch him regularly in Las Vegas and Atlantic City. He spent years as the mc/host/creative director of famed New York City hot spots like Catch A Rising Star and Dangerfield’s. He has also enjoyed a stellar career in radio where his quick wit and ability to ad-lib earned him the coveted morning show for a number of different stations in the New York metropolitan area. Currently he is in demand at comedy clubs, corporate events and everywhere great comedy is available. Watch Mike once and you will think he is making up everything that comes out of his mouth right on the spot. Watch him a number of times and you will realize that happens alot! If you are a fan of funny and you are a fan of smart, this is one comedian you cannot afford to miss! Jay Black is the perfect example of living out one’s dreams. Quitting a stable, decent-paying job to pursue a career as a stand-up comedian, Jay was able to satisfy an itch he had since he was a little kid living in South Jersey. Today, rather than watching others make people laugh, Jay is the one up on stage. And, honestly, he’s loving it. 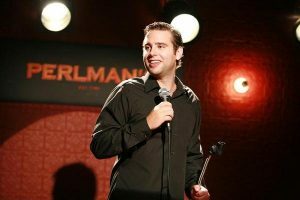 How he began his stand-up career–While working as a teacher in South Jersey, Jay started doing open mic nights to impress a girl who eventually became his wife (“she was Major League Baseball, he was girls’ Intramural Cricket,” he quipped). He also did it to get the stand-up bug out of his system. Problem was, they kept asking him back. Soon enough, he was getting paid more for his comedy gigs than he was teaching. It was at this point that he waved good-bye to his teaching job while he got a regular gig at Philly’s Comedy Cabaret. ake is sound like he actually had fun. His humor is operational and largely based in pop culture, with jokes ranging from riffs on “Jersey Shore” to commentary on Boston accents. Audiences will hear about his ‘ never good enough to please ” father –a straight from Italy immigrant, and laughed at his father’s mispronunciation of the President of the United States.“Morakema Bamboo,” Conte said. “I was on the floor in tears.” He shares his wit about his narcissistic and always the victim-but sweet- mother Conte saves most of the venom for himself admitting to have “zero confidence.” “I’ve been single most of my life,” he explains. He said the longest relationship he had been in was 18 months. “She ruined it by coming out of her coma.” He is likeable, yet can make you squirm in your seat He is pathetic and hysterical in one package. His high energy grabs you and brings you along his bumpy ride. 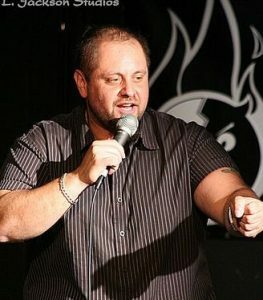 Larry DeFelice has performed his unique brand of comedy for clubs, pubs, restaurants, fund raisers, theaters, corporate and organizational events. His clean, high-energy act has been enjoyed by audiences in venues ranging from traditional comedy clubs to church basements to banquet halls. He has been seen in a national television commercial for Circuit City Electronic Stores, as well as sketchwork onNBC’s Late Night with Conan O’Brien show. He has appeared on The New Rascals Comedy Hour and The Wiseguys Show on Sirius/XM Radio. Impressions of TV and movie characters fill his act, which is also peppered with his life experiences of being “on the cusp”. (Larry’s height of 4’10″ puts him “on the cusp” between “The Normals” and “The Little People”) Think, “The Sopranos meets Fantasy Island”! 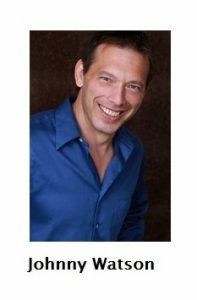 Born in Jersey City, NJ, Larry grew up in the NYC Metro area, and while he always enjoyed presenting oral reports and creative writing assignments in school (Geek! ), he never thought of pursuing a career on-stage. It wasn’t until years later that he found himself doing impressions of legendary comedians like Dangerfield and Carlin at college parties. Larry frequently entertained co-workers at his retail job with impressions of various managers and customers. 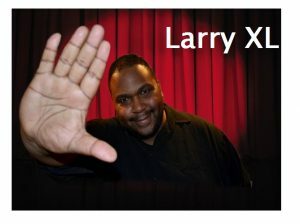 Upon joining a sketch and improv troupe in 1996, Larry decided to pursue comedy professionally and began going back to the new talent shows. He soon was getting his first paid gigs and comedy changed from a hobby to a career.